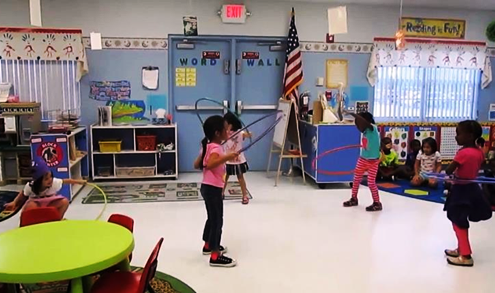 This past September, in recognition of National Childhood Obesity Awareness Month, Florida’s Department of Children and Families’ (DCF) Office of Child Care Regulation and Background Screening kicked off a special hula-hoop challenge to child care providers across Florida through the PREVENT Obesity initiative. “Our department teamed up with child care providers across the state to encourage children to be active, get moving and support healthy lifestyles at an early age,” DCF Interim Secretary Mike Carroll said. This year’s theme, Healthy Options for Obesity Prevention (HOOP), challenged child care providers to be creative with promoting physical activity using hula hoops – jump through hoops, roll hoops, run through hoops, make an obstacle course out of hoops, relay race and hand off hoops, yoga with hoops, dance with hoops, toss hoops and more. Florida’s Department of Children and Families’ (DCF) Office of Child Care Regulation and Background Screening started a program in 2012 to provide resources and training to child care providers and families across the state to help prevent childhood obesity. The PREVENT Obesity initiative Provides Resources, Evidence, Valuable Education and Training to reach child care providers throughout Florida. The mission of the PREVENT Obesity initiative is to be a catalyst in the fight against childhood obesity by ensuring child care providers are equipped with quality education, best practices and tools in the three proven areas directly linked to obesity prevention: nutrition, physical activity and limiting screen time. “As a center, we strive to provide as much education to our families in all aspects of early childhood education, however the nutritional information has always been a weaker point,” said New Dimensions Learning Center Director Kenyatta Jelks. She created healthier menus, built a garden and implemented nutrition into daily lesson plans. With obesity-related problems affecting the health and future of Florida’s children, the Department of Children and Families created the PREVENT Obesity initiative which Provides Resources, Evidence, Valuable Education and Training to reach facilities and homes throughout the state of Florida.